"This recipe is very slightly adapted from one by someone called Friendlyfood on Allrecipes, who claims it was adapted from a version made at the Savoy Hotel in London. I have to say, I am very impressed. It was light, tender, moist and very delicious." Whisk flour, white sugar, baking powder, and salt in a mixing bowl. Cut in butter with a knife or pastry blender until the mixture resembles coarse crumbs. Stir together 1/2 cup milk, sour cream, and currants in a small bowl; stir into flour mixture with a fork until just moistened and holding together. Transfer dough to a lightly floured surface and pat into rectangle. Fold the rectangle in thirds. Turn dough a half turn, gather any crumbs, flatten back into a rectangle, and repeat. Cut into eight pieces and place each scone on a silicone baking mat. Whisk egg and 1 tablespoon milk together in a small bowl; brush mixture on top of each scone. 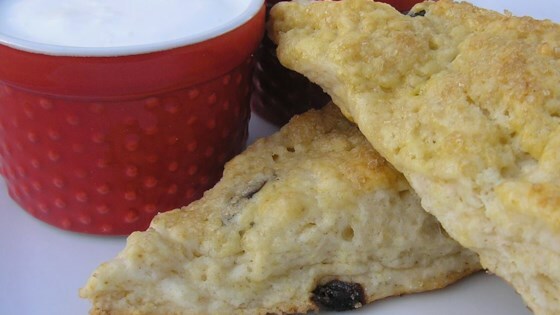 Bake scones in the preheated oven until risen and golden brown, about 15 minutes. Remove and transfer to cooling rack. For a special treat, try these topped with Chef John's Clotted Cream and jam. It was a crumbly mess and it would not come together. Absolutely delicious. Moist, tender and a perfect scone. Like the other reviewer, I used splenda and dusted half tof the scones with raw sugar. YUMMY! These are on the other side of fantastic! I added candied ginger, lemon zest and vanilla. The possibilities are endless! Very good! I used my homemade fat free yogurt instead of sour cream and dark chocolate chips since I had no dried fruit. My 4 year old helped me and she also loved these! Ive made quite a few scones, I really like this recipe is was simple. I did zest it up by zesting lemon in it, and next time Ill use cranberries and orange zest.....yum.